Plot synopsis: A British botany professor plans to rid himself of his nagging wife before they set sail for a lecture tour of America, but oblivious of his intentions, her main concern is simply that they will be back home for Christmas. Based on a short story by John Collier, first published in The New Yorker magazine, on 7 October 1939; and later in his short-story collection The Touch of Nutmeg, and More Unlikely Stories, in 1943.
Review: Despite the title, and the dates of broadcast, this isn't a Christmas story in a conventional sense - it isn't set at Christmas, and even though the refrain of 'back for Christmas' is heard throughout, it isn't until the end that Christmas itself becomes significant. Of the three versions Suspense produced, the first starring Peter Lorre is the best, for the simple reason that Lorre's distinctive voice is always a joy to listen to, regardless of the material. In this case, the story is fine, but nothing exceptional. It is a tale of infidelity, bitterness and years of pent-up frustration, with a good twist ending. Yet at the same time, there's little here that listeners won't have heard, or read, many times before; even the sting in the tail will likely have been encountered, in different guises, elsewhere. It's worth noting that the original short story upon which the episode is based differs in various respects from the Suspense radio drama - for example, it's more graphic in its depiction of the story's murder - but the major elements of the plot remain the same. Plot synopsis: A couple returns to their car after a night out at the movies, but after setting off to drive home, they soon discover that they are not alone. Review: The urban legend of a killer hiding in the backseat of a car, waiting to surprise the unsuspecting driver, is a popular one in film and television. Usually in such tales, the driver remains unaware of the killer's presence for some time - though other drivers often try to give warnings by, for example, flashing their lights - but here the criminal reveals himself early on. This then leads to a battle of wits between the armed killer and the couple whose car he hijacks. Overall, this is a good story, which offers a clever plot, including some neat twists, and appealing performances by the real-life husband-and-wife team of Jim and Marion Jordan (probably best known as the eponymous characters in the Fibber McGee and Molly radio show, as they are indeed billed in this episode). At the same time, there are weaknesses. One of these arises from the fact that there are three people in the vehicle, rather than just a killer and his potential victim, which reduces the tension somewhat since the former is therefore outnumbered. Furthermore, I found the married couple just a little smug, especially following the crucial reveal concerning the husband at the end. Still, an effective thriller. Plot synopsis: A bank teller is kidnapped by a pair of robbers, but as they flee from the police, she starts to sympathize with her abductors. Review: I'm not entirely certain why I enjoyed this episode as much as I did, as there's nothing very original about the plot and the script isn't outstanding. However, what is effective and compelling is the characterization. In particular, the relationship between the female bank teller and the lead robber becomes, by the end, quite affecting. The former is played by an actress, Bonita Granville, about whom I knew very little beforehand (she was, subsequent research shows, a reasonably significant star in the 1930s and 1940s, though she faded from prominence not long after the war) and her performance is very winning. I genuinely felt for her character and wanted things to work out for her. By contrast, her smarmy, self-serving fiancé deserves to get his comeuppance; readers will have to listen to the episode themselves to find out whether or not he does. The conclusion, although there isn't any major unexpected twist, is also strong, offering no straightforward happy ending for any of the characters. Plot synopsis: A retired Scotland Yard detective attempts to close the one murder case he was unable to solve as an officer using an elaborate deception to force the killer to confess. Based on a short story by Rupert Croft-Cooke, first published in 1926, which he subsequently adapted as a play, in 1930.
Review: This episode's title is, of course, a reference to the character in Shakespeare's Macbeth who Macbeth has murdered, but who then haunts him as a ghost. This gives a very big clue as to how the plot plays out. Unfortunately, the title's literary allusion is pretty much the only 'clever' thing about the episode. Otherwise, it's a daft, creaky story, of the type that now feels deeply dated. It's also one of those tales that is entirely about the twist at the end, yet the problem here is that the twist is not only eminently predictable, but virtually inevitable given the set-up. 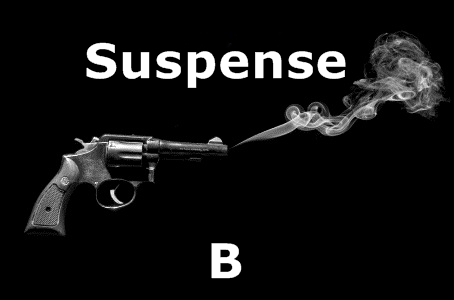 Suspense broadcast three versions, all of which are very similar, but for anyone who does want to listen to the story I would recommend the final one as the best, since it at least offers the pleasure of James Mason in the main role. Plot synopsis: A small town comes under threat when a rabid dog is stolen from a health centre and ends up on the loose. Review: A thrilling tale about … rabies. Trumpeted as being based in fact, this episode nonetheless struggles to make much of a dramatic impact. Yes, rabies is a serious disease, but the threat posed by a single rabid dog doesn't make for a very exciting tale - especially for a modern audience used to blockbuster movies (like Outbreak) that depict the possibility of animal-borne viruses that can wipe out millions. Another problem with the story arises from making an animal, rather than a person, the hunted quarry, since animals are driven purely by instinct - thus, they do not have any of the motives (psychological, emotional, financial and so on) that make human killers interesting. Nor is the thief who steals the dog a particularly colourful or engaging character. The episode also suffers from a dry worthiness, as in places it feels more like a public information broadcast, designed to warn listeners about the dangers of rabies, than a piece of entertainment. Finally, the story is all wrapped up too quickly and neatly. Near the end, we discover - SPOILER ALERT! - that a little boy to whom the thief gave the dog has been bitten, but the episode then simply concludes by telling us in voice-over that the dog is found and that the boy is treated and gets better. Overall, an episode with little real tension or excitement. Plot synopsis: A man seeking revenge for the death of his son in a hit-and-run car accident records the details of his plan to exact vengeance in his diary. Based on a novel by Nicholas Blake (the pen name of Cecil Day-Lewis), first published in 1938.
Review: The novel upon which this episode is based is, according to a list compiled by the Guardian/Observer newspapers in 2009, one of the 1,000 novels everyone should read. Such lists should, of course, always be treated with great caution, but this does give some indication of the novel's status, at least among critics. The book is the fourth in a series featuring the detective Nigel Strangeways, but in this radio adaptation his character has been entirely removed from the story, leaving the focus upon the writer protagonist whose quest for revenge is the driving force of the plot. To condense the novel into a thirty-minute running time it makes sense to make this relatively radical alteration and it also helps the episode work as a standalone story (this solution is also used by another Suspense episode, The ABC Murders, which similarly leaves out the detective hero of its source novel, Hercule Poirot). In any case, this is a strong episode, with a compelling plot and well-rounded characters, especially the protagonist, whose motivation for wanting to commit murder - to avenge the death of his young son - is both understandable and tragic. The script, too, is accomplished, with enough twists and turns to keep the audience guessing right up until the end. All told, a superior crime thriller with a surprising amount of psychological depth. Plot synopsis: A mild-mannered widower marries for a second time, only to discover that his new wife is a mean-spirited gold digger - and begins, therefore, to devise a plot to be rid of her. Review: Stories about henpecked husbands dominated by overbearing wives can seem quite dated today, not to mention 'sexist' - while a man who is assertive and go-getting is usually presented as admirably ambitious, even heroic, in works of fiction, a woman possessing similar traits is instead often depicted as a shrewish harridan. However, in the case of this episode, the story largely gets away with its use of such stereotypes (at least until the end) because it doesn't overplay them, and there is a lightness of touch to the characterizations. At any rate, the main character is a sympathetic one, and we genuinely feel for this man who is simply looking for companionship for his impending retirement, and who is essentially duped into marriage by his scheming soon-to-be wife. The twist at the end is also pretty good (not outstanding, but solid), although here again a question is raised about whether there might not be double standards when it comes to men and women. The ending - SPOILER ALERT! - involves the wife being treated as clearly mad by the police because she accuses her husband of attempting to murder her (which he did try to do! ), and the doctor who examines her very quickly jumps to the conclusion that she ought to be committed. Sure, the wife may deserve a comeuppance of some sort for her mistreatment of her husband, but she isn't insane, and there is something troubling about the fact that simply because everyone believes she is a 'hysterical', irrational woman, the only course of action considered is to consign her to a mental institution. Even so, the episode works well in its own terms, as a carefully plotted suspense story, and overall I was generally happy to forgive it any sins.